Interact Marketing now maintains Facebook Certified Buyer status, further solidifying a company-wide commitment to maximize service value to clients. 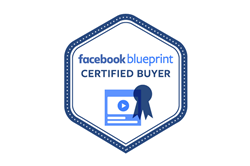 On March 9, 2019, head of Interact Marketing’s social media department, Kristen Semple earned the Facebook Blueprint Buyer Certification. This digital badge verifies that Facebook ad campaigns managed by Interact Marketing are optimized for campaign efficiency and maximum impact. Interact Marketing’s commitment to maintaining the highest certifications in the digital marketing industry, specific to each department is an integral part of how the 10-year old agency is positioned. All of Interact Marketing’s senior staff has either a marketing MBA or at least five years of commensurate experience. In addition to that, Interact is recognized as a Google Partner for maintaining Google’s advertising certifications, managing over one-million dollars for clients annually, and for showing solid ad revenue and growth. Interact’s Google Partner digital badge demonstrates the agencies advanced knowledge in both search and mobile advertising. Other certifications earned by the agency include Bing ads, Google Tag Manager, SEMRush Digital Marketing Certification, Hootsuite Social Marketing Certification, WordPress, and MySQL. Maintaining the highest levels of industry-recognized certifications was important to Interact Marketing CEO, Joe Beccalori from the start. The agency was founded in 2007 at a time when digital marketing was still in its infancy compared to what it is today. What Beccalori saw over time in the industry concerned him. With nearly twenty five years in digital marketing and thirty years of web technology and security expertise, Beccalori takes this commitment to quality seriously. Certifications are renewed by the team annually, and frequent research and development meetings among account managers help keep Interact’s services a level above local agencies. Kristen Semple’s Facebook digital badge is publicly available to view and verify for more information. On making the certification official, Semple remarked, “The Buyer digital badge was hard-earned and took months of preparation. To earn this certification, you have to pass two proctored exams and have at least half a year of agency experience as a prerequisite.” Upon earning this certification, Interact enters an elite status of agencies with this level of expertise.